I lived around 20 years of my life as an able-bodied person. Then, everything changed. I developed the neurological condition postural orthostatic tachycardia syndrome (POTS). It affects the way blood flows around my body and it means if I stand up, I faint, so I now use a wheelchair. To suddenly become disabled gave me a real wake-up call. I realised how rarely disabled people are represented in the media and I began to feel isolated. I want to try to change that - showing the film, music and fashion industries what they’re missing. I’m now a disabled model and an ambassador for Models of Diversity. I hope my Fixers campaign helps others see that the media should be embracing disabled talent, not excluding it. Lisa, who plays the role of Donna Yates in Eastenders and is a disabled actress, has supported my Fixers project. I was able to interview her over Skype to appear in my broadcast piece. Patricia MacCormack, Professor of Continental Philosophy at the university, supports my Fix. She agreed to be interviewed to appear in my broadcast film. The team at Sorellas With Love have given their backing to my project. They allowed us to film scenes for my broadcast piece at the salon. Thank you also to Kay Crimmins who provided help on the day of my broadcast shoot and to Terry Croker who attended a screening of my film and took part in a focus group that was filmed for my TV piece. 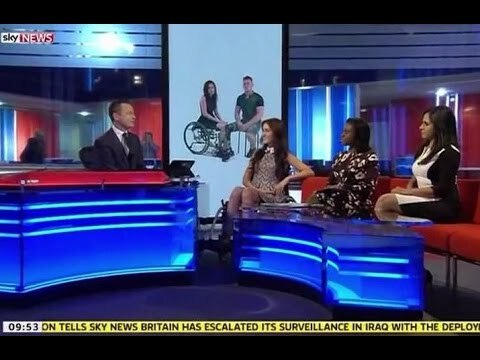 On Saturday 16th August I appeared on Sky News. I was featured on the show to discuss my message and my continuing campaign to see more people with disabilities in mainstream media. Watch the segment below! My Fixers film was posted on the Upworthy website! Click the link below to see. The website 'Women You Should Know' also published an article about me. Here is some feedback I have received for my Fixers campaign.